It must be strange and incredible to unbelievers to hear that your Icon, The Inexhaustible Cup, procures miracles. But to us who believe in your words proclaimed about your first Icon, “The grace of the One who is born of me and my own blessings will always be with this Icon,” this present Icon also exudes your mercy. And so, reverently, we venerate it, crying to God: Alleluia! O all-merciful sovereign Lady, we come to your protection. Do not despise our petitions, but kindly hear us—wives, children, husbands, parents, and all those who suffer from heavy affliction of addictions of all sorts—and restore those who, because of it, fall away from our holy Mother the Church and its salvation. O merciful Theotokos, touch their heart and speedily restore them from their fallen state, and lead them to salutary repentance. Implore your Son, Christ our God, to forgive us our trespasses and not to turn away His mercies from His people, but that He would strengthen us in sobriety and chastity. 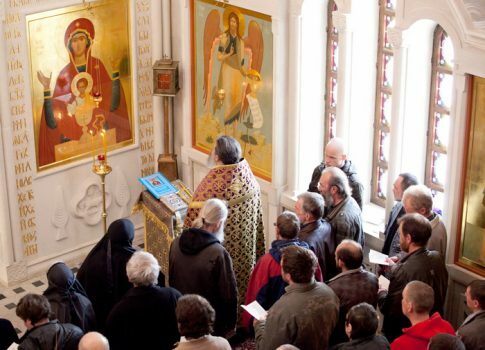 Accept, O all-holy Theotokos, the petitions of mothers shedding tears about their children, wives sobbing for their husbands, children, orphans, beggars, and all those who were forsaken, and all of us who venerate your Icon, and let your prayers carry our petitions to the throne of the Almighty. Cover us and keep us from all snares of the enemy and the traps of the evil one, and at the dreadful hour of our death, help us to pass the ordeal without stumbling. By your prayers, save us from eternal condemnation so that God’s mercy may cover us for the ages to come. Amen.